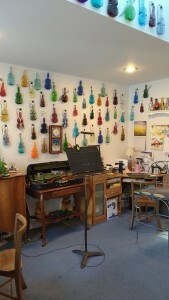 Mom’s studio is filled with hundreds of violin bottles. They bring a lot of color into her teaching space. When you walk into my mom’s studio, it doesn’t look like your typical teaching space. 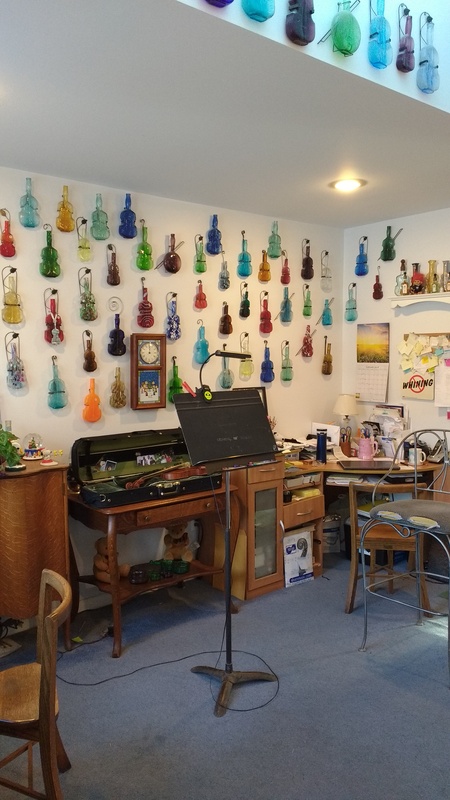 Hundreds of violin bottles line the walls, a “no whining” sign hangs prominently and music is placed on a stand with a sticker that reads “Tune it or Die!” Deer, squirrels, and birds make regular appearances during lessons and having a “nature break” during your lesson time is not unusual. When you walk into my mom’s studio, it’s not your typical space – but then again, I’m sure the hundreds of students she’s had will agree she’s not your typical teacher. My mom is Marla Smith – MASTA’s newest Teacher of the Year. 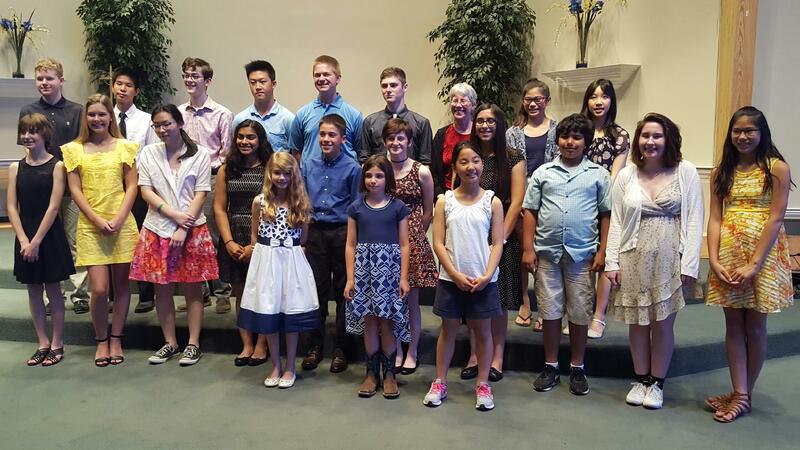 Mom always ends her recitals with a group photograph. 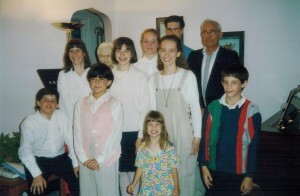 This photo is from May 1994. The little girl in the front is me! 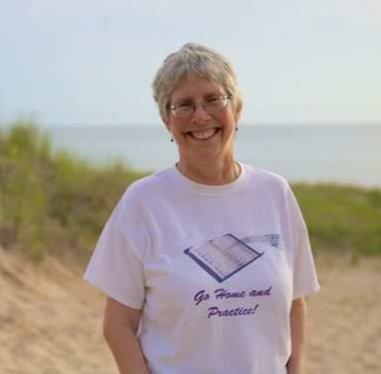 Marla started teaching in 1987 – though she can’t remember how she got her first student. A student of Romeo Tata, Paul Makanawitzky, Ruggiero Ricci, and briefly Ivan Galamian and Stuart Canin, Marla had a lot of great teachers to draw inspiration from for her own students. Her first teacher was her mother, Patricia Smith, who was MASTA’s Teacher of the Year for 2000. 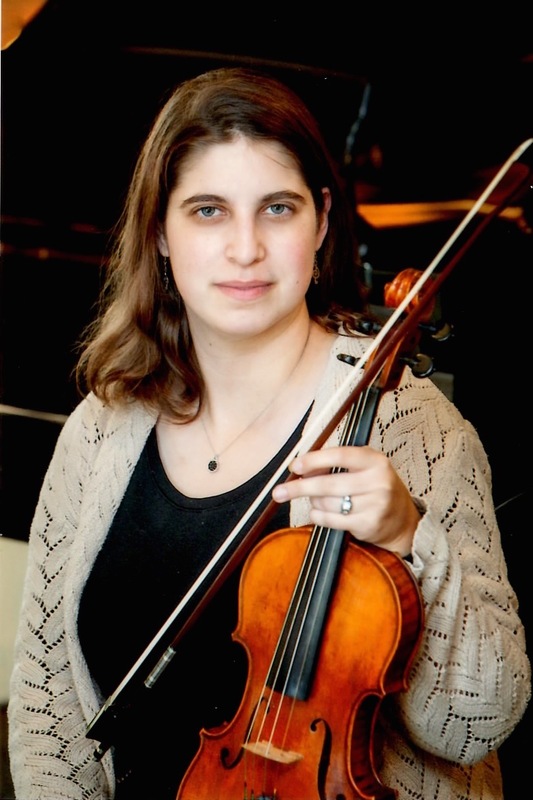 Mom calls her the “quartet queen” and her groups routinely receive 1st division ratings at MSBOA Solo and Ensemble festivals, as well as appear at the Michigan Youth Arts Festival. This photograph is from Mom’s June 2016 studio recital. I haven’t been around for all of my mom’s teaching years, but I have been around for many. According to mom, I used to sit in her studio and unpeel crayons as a kid during her lessons to entertain myself. I remember mom’s students being my babysitters when I was young, and turning into my friends as I got older. I remember trying to mimic some of the more advanced songs that her students were playing on my violin as a kid, just to see if I could. Some of her students became like siblings to me, especially the ones I went to school with. I know that none of those relationships would exist if my mom wasn’t the caring, dedicated, and inspiring teacher that I know her to be. Most of my mom’s students stay with her for years and some have even come back to her studio after college. Marla encourages anyone who wants to teach to love what you do. “That shows through to kids more than anything,” she said. It’s that kind of attitude and approach that has lead to her success over the years. Mom said she was “stunned” when she found out she was nominated, but anyone who has had the pleasure of knowing her, being her student, or watching her work can only say two words on her win: Well deserved.